It’s the California dream to have a swimming pool for fun-filled days with family and friends enjoying backyard barbecues, parties, and swimming. However, along with the wonderful benefits of having your own swimming pool, spa, and water slides comes the ever-present dangers of children gaining access to your pool area unnoticed and accidentally drowning. 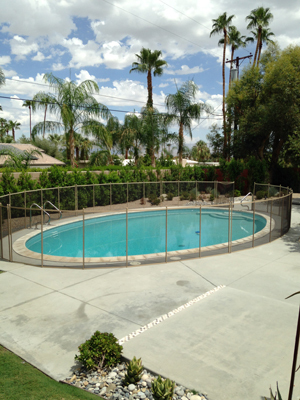 Desert Pool Guard is the most trusted name in Removable Mesh Swimming Pool Fencing serving pool-owners in all of California’s desert communities. 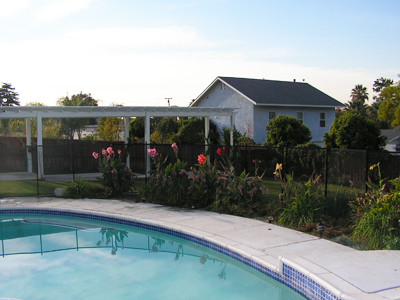 The most important part of a pool fence is the pool gate because it’s the access to the swimming pool and spa area. Although the removable mesh pool fencing comes with the option of a manual gate, it is much safer to install a self-closing/self-latching gate. A manual gate can be accidentally left open, or not closed properly therefore presenting a danger of small children or pets drowning in your swimming pool. That’s why the pool-safety-experts at Desert Pool Guard want to inform you about the importance of installing a child-proof, self-closing removable mesh pool gate with the Key-Lockable Magna Latch to protect your little children and pets from a tragedy. Remove the worry about your pool gate being left open by installing a self-closing, self-latching, and key-lockable removable mesh pool gate for your Palm Desert pool. When you come out of your swimming pool and exit through the mesh removable safety pool gate it will close automatically and you can lock behind you. Low Desert residents can rest assured that Desert Pool Guard meets California State Laws for pool-fencing required for child adoption, foster parent care, kinship care and day care providers. Little children will be protected with our child-proof patented self-closing, self-latching and key-lockable gates as recommended by the American Academy of Pediatrics. A Desert Pool Guard removable mesh pool-safety-gate is the most important feature when it comes to preventing children or pets from accidentally gaining access into Low Desert swimming pools and spa area. We give you the option of a manual pool opening; however, a more reliable pool-safety-barrier to install is a Self-closing, Self-latching, Key-lockable, Removable Mesh Safety Pool Gate from Desert Pool Guard. With over 20-years experience, Desert Pool Guard is the only company in the Removable Mesh Pool Fencing industry to offer two types of self-closing, self-latching, key-lockable pool gates to protect your small children from accessing your desert community swimming pool and spa. 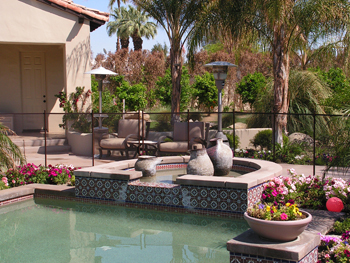 Desert Pool Guard can install a Key-Lockable Magna Latch on the inside or on the outside of your High Desert pool gate. Our installer are also happy to install the lock at fence height or higher, well out of a child’s reach. This is something other companies just don’t offer. The pool safety gate opens away from the swimming pool. This prevents kids from pushing their way to the pool and should a child somehow stand on something to get to the Magna Latch, they couldn’t open the gate anyway because they are actually blocking it. 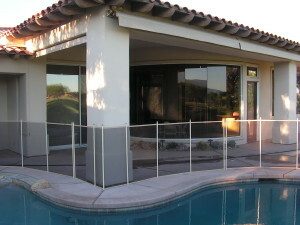 This is a major safety feature, and another layer of protection that Desert Pool Guard offers you. Our removable mesh safety-pool-fence-gates are safe, convenient, and are “stand alone” or monolithic meaning that gates don’t rely on the tension of the fence to stand up straight. The disadvantage of a non-standalone gate is that if the gate gets closed too hard it won’t lock, of if a child pulls or pushes on the fence the gate may not close properly because its not aligned. Desert Pool Guard offers the best and strongest removable mesh pool safety gates available, so there is no doubt that your swimming pool is secure. The most important safety benefit is the automatic close and lock feature when you exit the swimming pool and spa area. 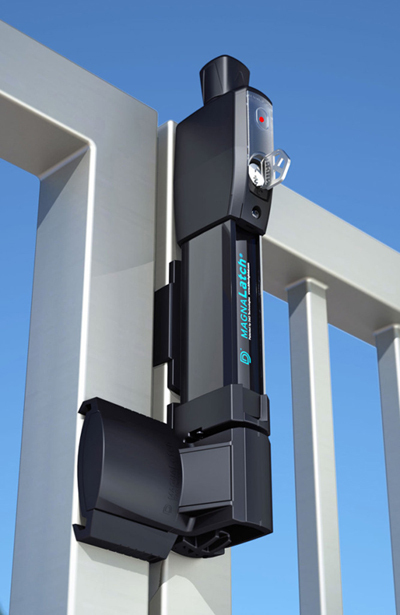 You no longer have to wonder if you closed the pool gate, or if someone else didn’t close it. Installing a self-closing, self-latching, key-lockable Desert Pool Guard removable mesh safety-pool-gate is the best pool gate option when it comes to protecting children or pets from accidentally getting into your desert area swimming pool and spa. A recent study conducted by the Consumer Product Safety Commission indicated that 85% of accidental drownings of children in America under 14 years old happen in a residential swimming pool. These are disturbing facts for Californians with a swimming pool, spa, pond, or water feature on their property. The need for swimming pool safety awareness has reached new heights because child-drowning deaths have increased, and what is heartbreaking is that it is preventable. Your best solution to safeguarding your crawling baby, toddler, small child, or pet from getting into your swimming pool and spa area is a Removable Mesh Pool Fencing and Child-Proof, Self-Closing, Self-Latching, and Key-Lockable Gate for the utmost protection. Little children can quickly dart out of your sight and sneak out of your home through pet doors, windows and doors that parents were not aware the child knew how to unlock. A removable mesh pool-safety-fence and pool gate installed around your swimming pool or spa area from Desert Pool Guard will prevent accidentally drowning. Many child-drownings are a result of a child sneaking into a neighbor’s pool. This puts a responsibility on all California swimming pool owners, not just those with children, to make sure they have secured their pool and water features with reliable Desert Pool Guard pool-safety fencing, and self-closing/self-latching and key-lockable pool safety gates.